Of the thousands of unaccompanied minors from Central America who have been streaming illegally into the United States recently, about 1,100 have been settled temporarily in Georgia, according to state and federal officials. The issue has become a political lightening rod, but Georgia has a lot of experience sheltering people fleeing violence and oppression abroad. Thousands of refugees have settled in Georgia in recent decades, many in the city of Clarkston, about 10 miles east of Atlanta. They have what’s called refugee status, a special legal protection that allows them to stay in the United States -- something not all unaccompanied minors have. Susan Rai, 10, came to Clarkston as a refugee with his family two years ago from Nepal, and remembers it was a bit of an adjustment. But for eight weeks each summer, Refugee Family Services, a non-profit organization in Atlanta, has been helping to smooth the transition to life in the United States and help students prepare for school in the fall. During science time at camp, Rai pats down clay around a plastic bottle with focused determination, building his volcano. An instructor pours vinegar into the bottle and it erupts. It’s a classic science experiment, but one that’s new for Rai and for many of the nearly 40 students at this summer camp -- all who are recently arrived refugees who’ve resettled in DeKalb County. “The majority if not all of our students were born in refugee camps,” says Madison Pollock, youth development coordinator at Refugee Family Services. She says many students have not had any formal learning experiences and come from places with conflict or war. All of the children have arrived within the last five years, she says. “A lot of our students are multiple grade levels behind based on disrupted education that they’ve had in their lives,” she said. She says the summer camp’s programs are academically-focused and incorporated a lot of hands-on learning. This week’s theme is about rocks. In another classroom, students make ice cream – salt is a mineral – and in another, students like Partage Cadette, 8, are painting pet rocks. “Maybe I’ll call her Jasmine,” she said. But she was quick to learn, and this camp, has been a bright spot for her. She escaped with her sister from the Democratic Republic of the Congo. When she talks about how she walked with her sister all the way to Uganda, she leans forward, shrugs, and pouts. “Because sometimes, when I talk about something bad or hear something bad I make that face,” she says, when asked. Peter Otim, one of the camp’s instructors, was a refugee himself from Sudan, and says there wasn’t a camp like this when he came here as an 11-year-old in 2001. 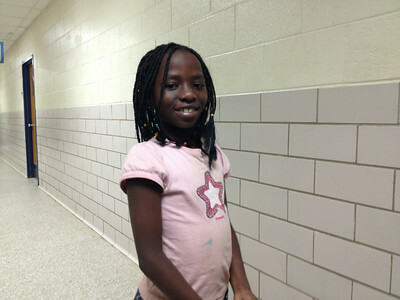 “This is a really nice environment where they can express themselves among students that are just like them,” Otim said. According to test scores, 100 percent of students here have retained or even improved their reading levels this summer -- which the camp directors say is especially important when going back to school next week.